You are currently browsing articles tagged Madrid. 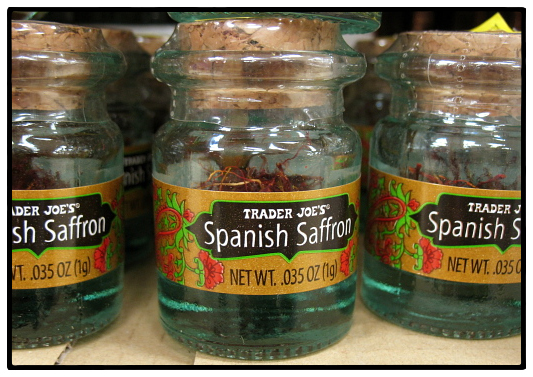 This Trader Joe's "Spanish Saffron" isn't grown in Spain either. But at least it only costs half as much as the so-called Spanish saffron in Madrid. This afternoon we are flying to Santiago de Compostela. So in the morning Eva and I go to the Mercado de San Miguel. She wants to pick up some Spanish saffron to take home for presents. “You know Spanish saffron isn’t really from Spain,” I tell her as we negotiate the crowd looking for stalls selling azafrán. Eva is outraged. In Spanish, she tells the woman who just sold her the saffron that I told her it came from Iran. The old woman shrugs her shoulder and looks away, neither confirming nor denying. “Esto viene de España, ¿no?” says Eva, pointing at the containers of saffron. The old woman points to the label that says Spanish azafrán. “Eso es lo que dice,” she says. “I don’t believe you,” says Eva as we leave the mercado. “It’s still a nice gift,” I tell her. Okay, maybe I should have kept my mouth shut. I mean, it is good saffron. But the thing is, it’s not Spanish saffron. Not anymore it’s not. 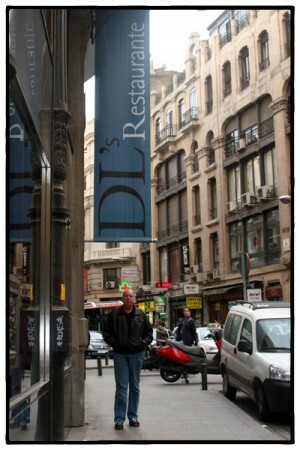 A sad man in search of coffee in Madrid on a Sunday morning. Photo by DL. Sunday morning I got up early and checked out of the Hotel De Las Letras. Eva was coming by about 9 to take me to the Ribera del Duero wine region about 150 Km. away. Since I had about half an hour until she arrived, I asked the clerk at the front desk if there was a café or something along Gran Vía where I could get a coffee. She looked at her watch and huffed. “Not this early,” she said. And it was true. I walked for blocks up Gran Vía and saw dozens of tired looking revelers looking like vampires afraid of the sun but not a single café where I could get a latte. After walking for about five blocks, I did come across a Starbucks. But it wasn’t open. Too early, I guess. I walked back to the hotel and went around the corner to DL’s, the hotel’s stylish restaurant (that I like to think is named after me) which was just setting up their Sunday buffet. I asked them if it might be possible to get a cup of coffee to go. Was I eating here? they asked. Sadly, no, I told them. I was just hoping I could get a cup of coffee. To go. The waitress said, “One minute, please.” She went off and spoke to a manager. The two of them looked at me while discussing the problem. Eventually the manager came over and asked if she could help me. “Yes, I’m checking out of the hotel this morning and was hoping I could get a cup of coffee to take with me as a friend and I are driving to Ribera del Duero. I smiled and handed her the cup. “This is yours,” I lied. “I had mine back at the restaurant.” She thanked me and we left. For the long drive to Ribera del Duero. Sans coffee. Piropo illustration by Nick Mahshie. It is late afternoon and I am walking down Gran Via with Eva when a flashy twenty-something male, passing in the other direction, says something under his breath to which Eva hisses. Like a cat. “What was that about?” I ask her. So what, you wonder (as did I), is a piropo? No. And that’s the problem with piropos these days. 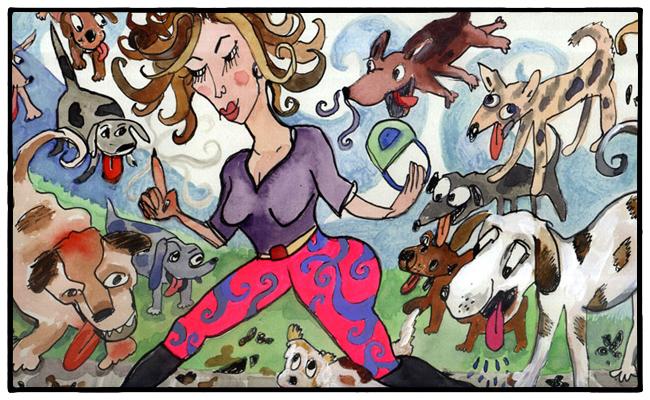 What was once a subtle form of flattery has morphed into something crude and offensive. In the old days, a piropo was considered something of an art form. Think Shakespeare: “See how she leans her cheek upon her hand! O that I were a glove upon that hand, that I might touch that cheek!” That line, from Romeo and Juliet, is nothing more than an old fashioned piropo, and what woman would hiss at an admirer murmuring such a desire? Two other old school piropos: “Where you go, flowers must spring up” and “If beauty were a sin, you’d never be forgiven.” Over the top and a little corny, yes, but certainly nothing that a woman would find offensive. But compare that to this piropo suggested on an iPhone ap called Piropos de Obrero (yes, there’s an ap for that): Si fueras barco pirata te comería el tesoro que tienes entre las patas. Translation? If you were a pirate ship, I would eat the treasure between your legs. Just what every woman walking down the street wants to hear. 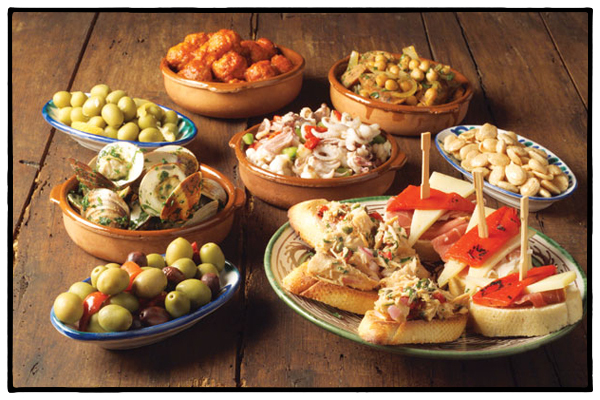 The tapeo, or eating of tapas, has a few unwritten rules. First of all, you don’t eat tapas in just one bar—you go to many. That’s part of the fun. And always you are having a little something to drink with your tapa (usually wine although OGs still order sherry and you’ll find the younger crowd sometimes going with beer). At some places you order tapas from a menu (this is becoming more the norm), but the old school way to do it is to just pick your plate of tapas off the bar. If that’s the case, you need to keep track of what you eat and confess it all when you ask for the check. At a traditional tapa bar, such as you might find in San Sebastian, it is an insult to leave your dirty napkin on the bar; you toss it on the floor instead. But look around and see if that’s what others are doing. You don’t want to toss your greasy napkin on the floor only to get a bunch of dirty looks from your neighbors. There are good tapa bars all over Madrid, but, for our money, the best area to tapeo is the street of Cava Baja in the La Latina neighborhood, which is lined from one end to the other with excellent tapa bars and restaurants. Even if you don’t have a particular destination in mind, just walk down the street and stick your head in the bar. If it’s noisy and crowded with locals, it’s probably a good place. One last thing: We’ve written over and over about how late Madrileños dine, but this isn’t true when it comes to tapeo when the busiest times are at what we like to think of as Happy Hour—say 5 to 7 or so. In Madrid, you meet friends after work and have a small glass of wine, maybe a tortilla de patatas or some salchicha and this is all just a prelude to dinner many hours later. Here, then, are our 10 favorite Madrid tapa bars (in no particular order) and what to sample. 1. Casa Lucas, 30 Cava Baja. Pork loin on a confit of onions. 2. Casa Gonzalez, 12 Calle de León. Pig’s cheek. 3. Almendro 13, 13 Calle Almendro. Huevos rotos (fried potatoes topped with a fried egg and chunks of cured ham). 5. Casa del Abuelo, 12 Calle Victoria. Shrimp with garlic. 6. El Lacon, 8 Manuel Fernández y González. Blood sausages with eggs. 7. 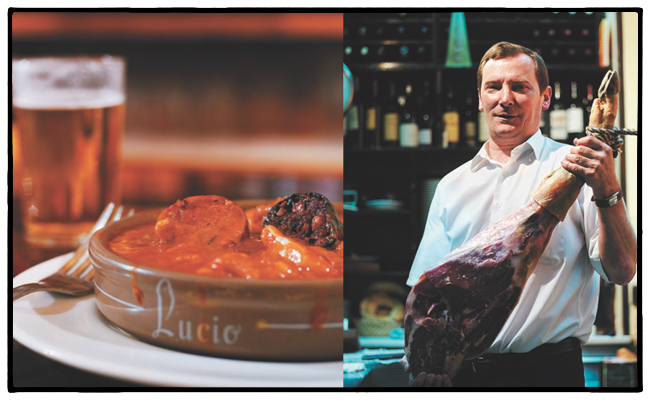 Taberna de Los Lucio, 30 Cava Baja. Any of the house egg specialties. 8. Vinoteca Barbechera, 27 Calle Principe. Solomillo with caramelized onions. 9. Juana La Loca, 4 Plaza Puerta de Moros. Risotto with truffles. 10. Cerveceria Santa Barbara, Plaza Santa Ana. Boquerones (white anchovies) in vinegar. You know how in New York people argue over who makes the best bagels and in Chicago it’s over pizza? Well, the same thing happens in Madrid when it comes to tapas. Should the patatas bravas have a soft or crunchy crust? Should the boquerones be served in vinegar or deep fried? Wine or sherry? Bread or toast? It all depends on who you ask. The other thing is that the tapas in Barcelona are different from tapas in San Sebastian which are different from tapas in Galicia which are different from tapas in Madrid. Even in Madrid, you will find huge differences in, for instance, that most traditional of Spanish tapas, tortilla española. Some make it with onion, some with green pimientos, and others with bacon. Who’s to say which is the traditional one? That said, here is our list of the Top 10 Traditional Spanish tapas, the ones you must try before you start getting all experimental. Tomorrow we’ll list our favorite tapa bars in Madrid. 1. Tortilla de patatas. This has nothing to do with Mexican tortillas. Rather, it’s an omelette with fried chunks of potatoes that we prefer in a wedge with ham and cheese. 2. Gambas al ajillo. Sauteed prawns with garlic. Or try them pil-pil (with chopped chili peppers). 3. Pulpo a la gallega. 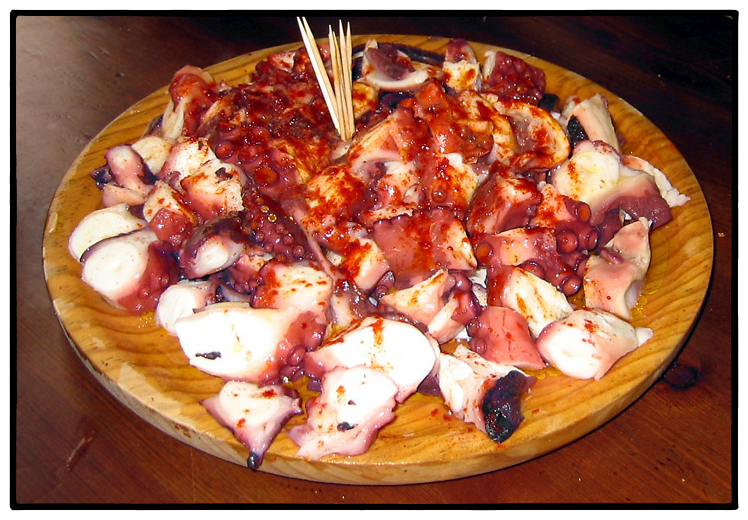 Galician-style octopus served in olive oil, lots of paprika, and sea salt. 4. Jamon iberico. Paper-thin slices of the classic Spanish ham from Salamanca usually accompanied by toast with a tomato spread. 5. Aceitunas. We love Campo Real olives or the big ones filled with anchovies. 6. Bacalao. Salted cod loin sliced very thinly and served with toast and tomatoes. 7. Solomillo. An old-fashioned tapa made from what we would call the fillet of beef although another traditional tapa, solomillo al whisky, is a fried pork scallop marinated in whisky and olive oil. 8. Croquetas. One of the most common tapas, try the croquetas de espinacas y queso made with spinach and cheese. 9. 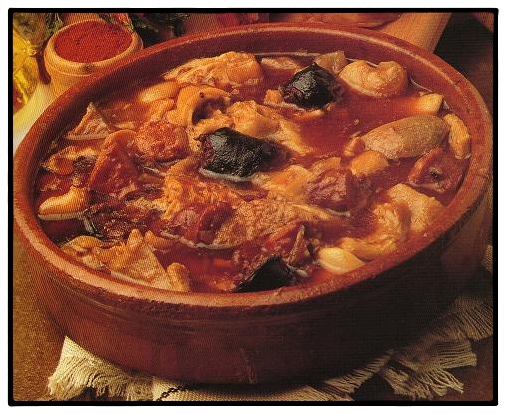 Callos a la madrileña. Okay, I’m pushing the boundaries a bit here—this is a traditional tripe dish slowly cooked in a broth with paprika, tomato sauce, and garlic. And it’s delicious. 10. Salchicha. Simply put, these are sausages and will vary from bar to bar. We like the dried dark red spicy chorizo slowly cooked in red wine.